Originally published in The Paper of Wabash County. Woodward is the owner of West Plains Mining, a limestone quarry just outside Richvalley. At just 34 years old, he’s already been in the industry for 21 years. Toward the end of that time, Woodward began attending Wabash College in Crawfordsville. He later worked as the production manager for six operations in northwest Indiana. Shortly after he started working on his MBA at Butler, he was offered a job in strategic planning for a Fortune 500 company in a five-state region. Seven years ago, he set out on his own to build something special. Will has a passion for geology. His location, just east of Richvalley, is unique from that perspective. Most limestone quarries in northern Indiana mine ancient coral reefs. Woodward mines much deeper limestone in what he calls the “birthday cake,” three massive layers of limestone, each with different qualities and chemical makeup. In Indiana, the limestone formations are named after the place they were discovered. In this case, beneath a layer of overburden made up of shale, clay, sand, and gravel is a layer known as the Mississinewa formation. The lowest quality of the three layers, the Mississinewa formation is 111 feet thick, and it’s used for commercial purposes like building and road pads. Below this is the 92-foot-thick Louisville formation, which is made up of high-quality, calcium-rich limestone. The final, 149-foot-thick layer is known as the Salamonie formation, which is made up of limestone rich in magnesium. Woodward’s first four years on the site were dedicated to removing overburden and mining the Mississinewa layer in open pits for commercial uses. Over the past two years, the focus has shifted to mining the Louisville layer using an underground tunnel system. “The way the economy was for the past 7 years, we weren’t moving a lot of this commercial stuff, because there just wasn’t as much building going on, but we had a lot of demand for the high-calcium, pure quality stuff, so it’s like, ‘hey, why not mine that stuff underground,’” said Woodward. People often ask Woodward why he chose to set up shop off of old 24. It comes down to geology. The mine sits atop a special formation where the Louisville layer is relatively close to the surface, just 130 feet down. As you move north or south of Wabash County, the layer falls off. The reason for this is an ancient archipelago. Woodward mines limestone deposited during the Silurian period. A string of barrier islands once peppered the landscape in what is now Wabash County, separating the ancient oceans, which filled the basins on either side. At the time the Louisville layer was deposited, the area was like a calm, backwater lagoon. This allowed for the formation of high-quality stone. When the Mississinewa layer was deposited some time later, there were more storm events in the area, resulting in a lower quality stone. The events of the distant past have shaped the underground landscape, making the mile-long stretch on which the mine sits a prime location for the operation. It took nearly five years of research for Woodward to pinpoint the best location for the mine. He knew he needed to be in Wabash County to take advantage of the geological features that put the quality rock is near the surface. He also had to find a piece of land big enough to set up the mine and processing plant, and he also had to be able to get it zoned. Through his research, Woodward knew that the Richvalley location was a good bet, but without testing, it was still just a hopeful dream. To test the location, he sank 23 diamond-tipped coring drills hundreds of feet into the earth. The news only got better from there. When the Louisville limestone was tested, Woodward found out that the rock in this particular location was twice as strong as typical limestone. In fact, the sample Woodward sent to be tested turned out to be the strongest limestone tested in the world from a compression perspective. This would play a key role in the success of his most recent project, underground mining. In addition to broadening West Plains’ product selection with a second type of stone, the underground operation allows Woodward to mine in areas where an open pit would be impossible – underneath his processing plant and the business office. Two hundred and eighteen feet below the surface, at the bottom of one of the quarry’s two open pits are three tunnels. Through the entrance, a grid of tunnels has been carved through the Louisville layer. While the open pit quarry may conjure images of the town of Bedrock, made famous by the Flintstones, the man-made caverns underground, looking something like the inside of a stone cathedral, are reminiscent of the mines of Moria from the film adaptation of Tolkien’s Lord of the Rings. To “dig” into the limestone, Woodward’s crew uses explosives. While some worry about the effect that the blasts have on the surrounding area, Woodward says they don’t need to. Along with the procedure followed for miner safety during blasts, or “shooting,” as they call it, a seismograph is set up to measure each explosion. With open pit mining, Woodward’s crew drills vertically 52 feet deep at a time, filling the 6-inch holes with ANFO, a mining explosive. When mining underground, the holes are drilled horizontally, 16 feet at a time, into the stone walls. Woodward compares the process to peeling through a loaf of bread one slice at a time. The result is a series of massive tunnels and pillars. Currently, Woodward’s crew is “shooting the floors,” blasting further into the earth. By next month, the back height will be up to 56 feet. Supporting the ground above is a series of pillars carved out of the existing rock. The square pillars are on a grid system; every 45 feet, there is a 35-foot by 35-foot pillar. The crew leaves another pillar 45 feet to the north, south, east and west. 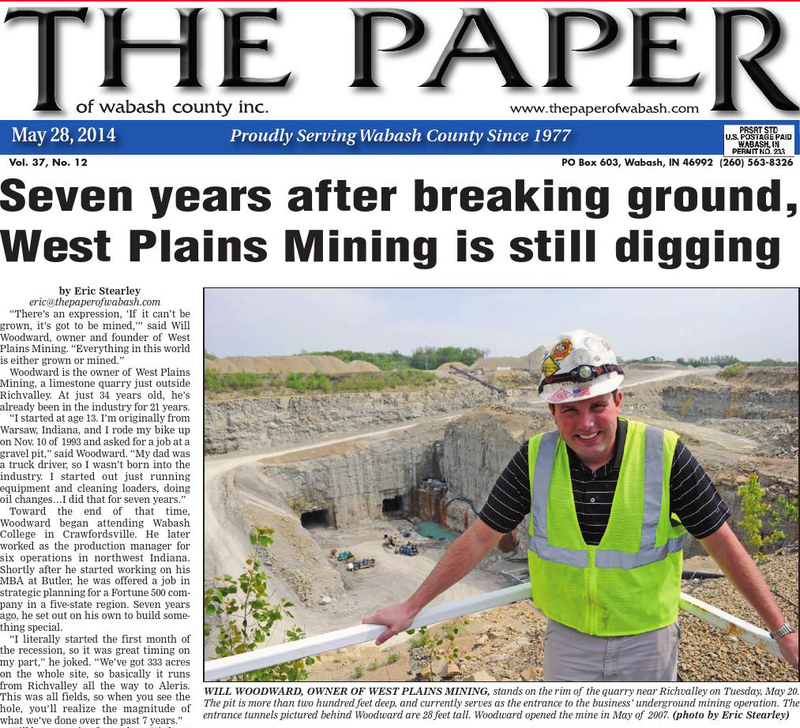 West Plains is one of six underground mines in Indiana, but theirs is unique. The superior strength of the rock in this location allows for bigger openings between each. Aiding in the effort to keep the ceiling structurally sound are 6-foot ceiling bolts, which secure the exposed layer of limestone to the layers above. Wabash local and Northfield graduate Garrett Kline drilled each one of the thousands of bolts into the ceiling. “The number one safety rule in underground mining is that you don’t have to worry about skin cancer,” Kline joked before inserting another bolt. “There’s obviously a lot more that goes into mine safety. Employees undergo 80 hours of training before they can work the mine, and there’s a strict protocol that has to be followed; every person entering the mine has to have a hard hat, light, identification, and a self-rescuer, which is an emergency breathing apparatus. The need for these, however, is very rare. Despite being underground, the mine is a comfortable work environment. It stays at 52 degrees year-round. “It’s a nice temperature,” said Kline. “When it gets really hot out and you come out of the underground, sometimes you kind of get nauseous from the temperature change,” said Woodward. To make the tunnels easy to navigate, Woodward named them using the county road system. Each “street,” as he calls them, is given a number and direction. “Right now, we’re at 6 North and 5 West, so there’s about 30 tunnels, and they’re all interconnected,” said Woodward. Woodward has worked at other sites where the roads were named after employees, but this can get confusing. Currently, it would be pretty easy to find your way out of the mine without the numbering system, but eventually the grid will contain hundreds of tunnels and 85 acres of open space. This is where the system becomes valuable. “No matter where you are in the mine, even if you’re at 37 West and 15 North, all you have to do is go to 0,0 and you’re going to get out, so you’ll never get lost,” said Woodward. The result of all of the pits and tunnels is two types of stone crushed to various sizes to create 17 unique products. Unlike the quarries in Bedford, which produce dimension rock, all the limestone at West Plains is crushed. This is due to two factors. The much younger limestone in Bedford is softer and useful for carving and constructing buildings, whereas the limestone Woodward mines is much harder. Unlike the Bedford rock, the limestone in Wabash County also contains small cracks and pressure seams, which are not ideal for dimension stone. At West Plains, trucks capable of hauling 55 tons transport stones as large as 6 feet by 6 feet to the on-site processing plant to be crushed. It takes more than 3,000 horsepower worth of electric motors to run the processing plant. The result is a variety of products; some is the size of baseballs, while others are ground to near-powder fineness. While the Mississinewa limestone is typically broken down to the coarse sizes, the Louisville limestone has a much wider variety of sizes and uses. It is the stone’s calcium content that makes this limestone so useful. When crushed into fine powder, the Louisville limestone is sold all over the Midwest as agricultural lime, which farmers spread on fields to neutralize the soil. Another product made and sold by West Plains is the kitty-litter-sized stone sold to power plants. Coal scrubbing is a process by which power plant exhaust is treated and cleaned. The calcium in the limestone bonds to the sulfur in the stacks and it falls to the bottom, removing it from the air. People use a lot of limestone. In addition to these products and the gravel used in a variety of ways, limestone is used to make concrete and asphalt. Woodward said the average American uses 12-13 tons of crushed stone, directly or indirectly, each year. At full capacity, the mine can achieve an output of 6,000 tons per day, or 25 semi loads per hour. Woodward experienced a full circle moment two years into the operation when his first boss in the industry, who hired him at age 13, began buying stone from West Plains. While the company currently has just a single site, Woodward left open the possibility of additional mines in the future. “If the economy warrants it and the locations are available, then yes,” said Woodward. “I mean, my goal in life is not to accumulate a pile of wealth, but to actually build something and see something grow. I’m not an imperialist by any means, but I just love to see something like this, which was literally just a thought in my head one night – to provide jobs and create something, to outthink a competitor, and to find something that no one else found is a really rewarding and gratifying feeling. I guess it’s kind of addicting, because once you do one, you’re like, ‘well, I want to do another one. West Plains currently employs 14 people, all area locals. In addition, 60% of the company’s money stays in Wabash County. The other 40% is spent on things like explosives and heavy equipment that are not available locally. Eventually, West Plains will mine the magnesium-rich Salamonie stone, but they haven’t gotten that deep yet. Woodward said that if they mined at full capacity, the underground mine reserves would last another 13 years, but at current production levels, it will likely take 25-30 years. In total, the property contains 160 million tons of limestone, enough keep the mine running for 70 years. When the operation is complete and the pumps are turned off, the groundwater, which is currently pumped out of the quarry, will fill the pits and caves. If the pumps were shut off today, it would take less than a week for the quarry to completely fill with water. As far as the immediate future is concerned, the miners will continue to expand both the underground and aboveground mines. Their current efforts to shoot the underground floor will allow Woodward to move the processing plant underground by this time next year. © 2019 West Plains Mining .